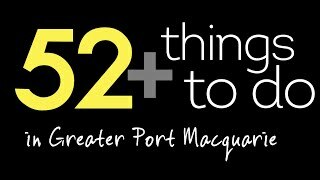 The Greater Port Macquarie region offers a fantastic lifestyle and climate, a rapidly growing and diverse economy, comparatively affordable and accessible land, and outstanding business opportunities. We have a strong labour force and, as a key regional centre, are well positioned to be a major beneficiary of the continued rise and popularity of the Mid North Coast. Travel time to work in the CBD of Port Macquarie is approximately 10-15 minutes for residents living in Port Macquarie, 30 minutes if you prefer a more country lifestyle out of town. Wauchope offers business and work opportunities too and with new housing development opportunities opening up, it's a beautiful spot to raise a family. Just think of how much more enjoyable your workday would be if, at the end of it all, nature’s playground is just waiting for you to enjoy. There are so many good reasons why you should leave the rat race and relocate to our piece of paradise. Click on the video icon on the right to watch 52 of them. The Eat See Do Guide is an insider's look at the best of everything to eat, see and do in the region and is designed to help you explore this amazing part of the world, to make the most of your stay. We've gathered all the juicy details and the necessary indispensable ones, so whether planning some serious indulgence, buffing up on your history, getting the adrenalin pumping or becoming one with nature....you will find all the tips in this little book.